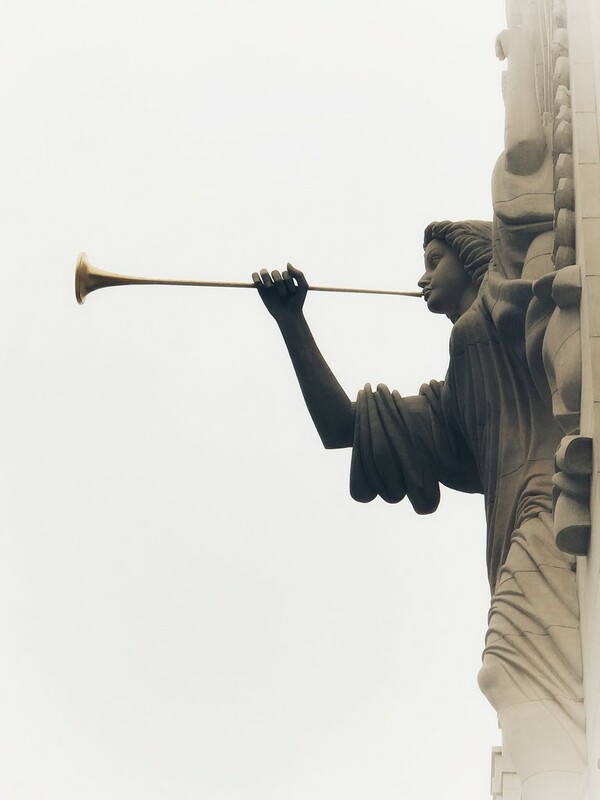 The 48 foot tall angels on the exterior of Bass Hall are beautiful. I was there on Saturday, a dark, dreary day, and took one photo of one of the two angels, side view. They are made of Texas limestone and considered cultural icons for Fort Worth. The concert hall itself has breathtaking acoustics, it is a true treasure for the city. Nice angle you have on the angel! Great picture! Beautiful image and a wonderful POV! Love your pov on this and it's a beautiful statue. A wonderful pov ,looking up to the angel !! and such a beautiful sculpture ! I'm glad this statue hasn't fallen to bits. Limestone can weather! That has got to be huge! @milaniet they are 48 feet tall! @maggiemae This limestone was treated with a stabilizing product of some kind, so they are not supposed to erode. Everyone was concerned when they were installed because of the porous nature of that stone. The sculptor and the construction company published articles about their durability. @ingrid01 @moviegal1 @bkbinthecity @gijsje @ludwigsdiana @jenp @mittens @beryl @mave @carolmw @sugarmuser @sarah19 @onewing @pistache @cocobella Thank you so much for commenting and your faves. You know if I lived in Fort Worth I would be downtown photographing the angels in every type of weather, every time of day and night and every season. They are truly gorgeous sculptures. Oh, this is beautiful. Your point of view and the placement besides the negative space of the background is just perfect. This is especially stunning when seen on black. Definitely a Fav. @chejja @grammyn @carole_sandford Thank you so much for your lovely comments and faves. This sweet angel is on the TP and PP because of you. Thank you! I like the clean lines and the white background setting it off so well. SO high up! Wow, just like the old film days - one shot and a keeper! @stray_shooter I was quite surprised when I saw this shot, ah the film days! Have you seen Jim Brandenburg’s “Chased by the Light: a 90 Day Journey”? He challenged himself to take only one photo a day between autumn and winter. The book is amazing. @louannwarren sounds very interesting. Gonna have to check that out. Thanks!